The abaya is traditionally black, but Hidaya makes them in lighter colours too, to suit local demand. Photo courtesy of Hidaya International. It is perhaps our inclination to soak up other cultures that we sometimes see the Malays wearing something other than traditional Malay attire on Hari Raya. It would have been unthinkable many years ago, but we did not have the style choices that we have now. But what’s tricky about taking outfits from other cultures and making them our own is that we sometimes get things wrong. A sartorial mistranslation, if you please. These can be harmless, or they can turn into a form of cultural appropriation, where no respect is paid to the people from which the clothing comes from. 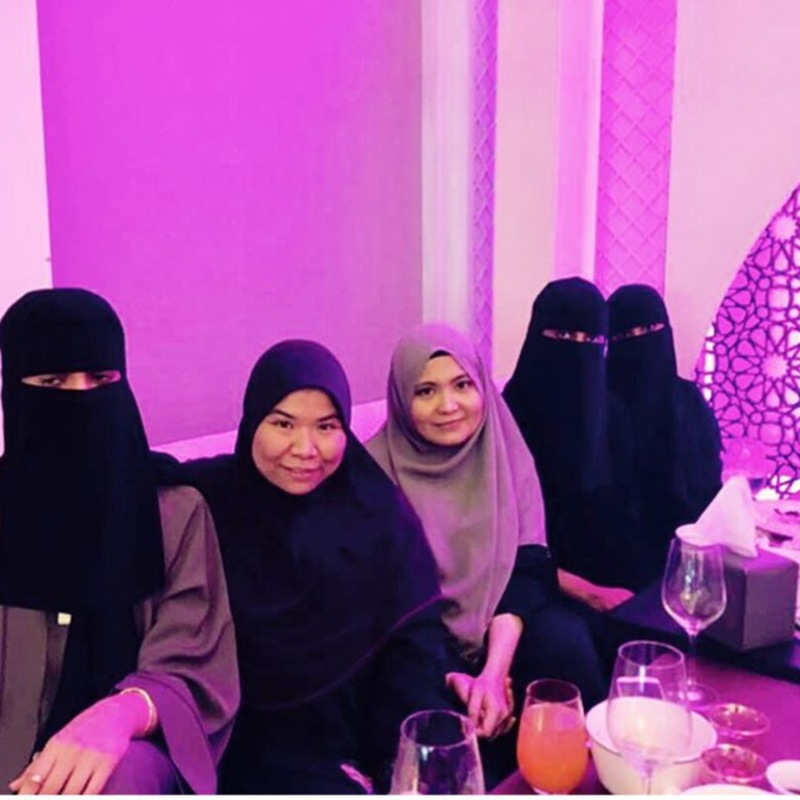 But the local women who have adopted the abaya tend to do so in deference, thanks to the increasing popularity and high esteem of Arab culture in Malaysia. We don’t speak Arabic though, so there’s still the matter of getting the terms right. By definition. the abaya is a robe that is always open at the front, though it may come with hidden buttons or clasps. Photo courtesy of Hidaya International. In a way, you can say that we’ve been wearing the abaya for hundreds of years. It is said that the robe came to our shores through Arab traders. Down the line, it became shorter and more close-fitting, and known as the kebaya. But the traditional abaya usually comes in black. Even the embellishments, such as the embroidery and beading, are in black. But there’s something about living in the tropics that make us shun black on black, in place of something with colour. Hidaya’s Hari Raya collection is called Sugar and Spice, and it includes light and pastel-coloured abaya as well as black abaya with colourful beading and embroidery. Other designs are further embellished with feathers and lace. An abaya from Hidaya International’s Sugar and Spice collection featuring fringe detail. Photo courtesy of Hidaya International. Other cultural differences include the size of the abaya. Women in the Middle East like their abaya loose and baggy. But customers here are more size-conscious. So while the abaya is generally loose-fitting, Malaysians still want it to fit well and not have it look like they’re borrowing someone else’s clothes. To meet the demands of Malaysian customers, Hidaya makes closed abaya, known locally as a jubah. It’s made with material that is not sheer or flimsy, so the wearer can wear it like a maxi dress without having to wear something underneath. It also has a style of abaya that comes with a matching waistband so it can be worn like a wrap dress. But that is by no means a traditional abaya. The black abaya is made with a special fabric manufactured in Japan specifically for the purpose and is shipped only to Dubai. That same material is not available in colour due to a lack of demand, so they make do with what’s available. Hidaya also does abaya for umrah and haj. These come in white, grey or black and are plain with no beadwork, or maybe with just a dash of Swarovski stones. It’s an option for the customers besides the traditional telekung. Hidaya International operates from its showroom in Ken Bangsar. It has booth at the concourse of Bangsar Shopping Centre during the Raya shopping period. Prices start from RM800. “When I was preparing to go to Saudi last year, all my abaya were loaned from my mum and younger sister. As someone who wears trousers a lot, moving to a country where you have to wear an abaya all the time is a huge transformation. “So I left with my husband with five abaya. Out of that five, only one is suitable for the office. It’s the only one with a front opening, because by then I had I realised the nature of wearing the abaya in Saudi is different than how we understand it in Malaysia. “We’re used to wearing the abaya or a jubah as a full outfit, whereas here it is closer to an outer wear like a jacket or cardigan. Frankly I only wear it for about seven minutes in the morning, because that’s how long it takes to get from home to the office because you take it off once you’re there. “I had wondered if I really need to do that, considering that we wear the same thing all day at work in Malaysia. But there’s a perception if you don’t take it off. The closest that I can think of is not putting your bag down. Imagine having your handbag on you all day, people will think you’ve just arrived or you’re rushing to leave. Photo: Zati Hazira (centre) with a Malaysian colleague and their students in niqab. “In general, the abaya in Saudi is black from head to toe. As a foreigner, I can wear colours, but to respect the local culture, I also wear black. I went shopping when I received my first salary, and the abaya choices baffled me. It all looks the same, but some can reach up to thousands of riyals. “I became aware of the difference in fabric. The main thing is that it doesn’t wrinkle or show the shape of the wearer’s body. It also needs to suit the weather, because it can get up to 45 deg C in the summer, and as low as three deg C in the winter. “I also found out that the abaya design syntax differs according to function. During Ramadhan last year, I was with a group of friends at a colleague’s house to break fast. I was admiring their abaya, but when we left for tarawih prayers, they changed into different abaya. To my eye, these look completely the same. “It turns out the prayer abaya has a clasp on the sleeve, so you can raise your hand without revealing your wrist. After prayers, we went to the park, and they changed into another abaya. It’s an exercise abaya with ‘hidden trousers’, although you can’t tell the difference just by looking at it. “But that is exactly the objective for traditional abaya wearers, which is to not show any visual differentiation in what they wear, even though the context requires variation in its design.